Environment • Opponents worried about the air, wildlife. Mark Havnes | Tribune file photo The Coal Hollow Mine, south of Alton in Kane County, is mining coal on a private tract of land. The BLM is proposing the mine be allowed to expand onto thousands of acres near Bryce Canyon National Park. 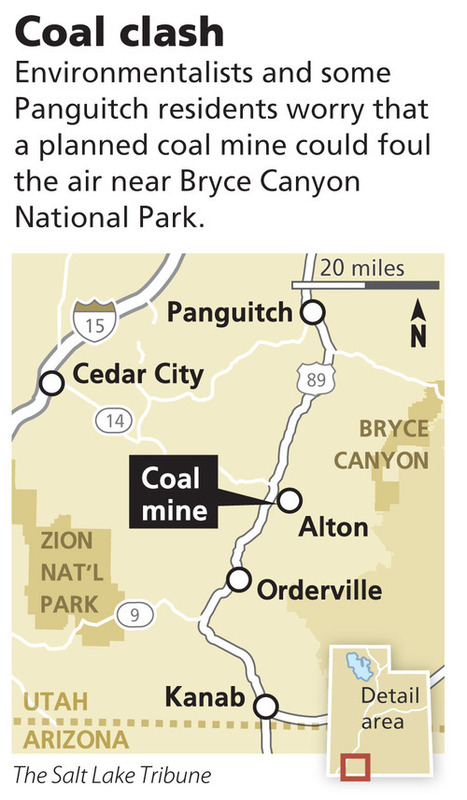 Plans to greatly expand a strip coal mine near Bryce Canyon National Park got a boost Friday from the federal government, leaving southern Utahns to debate which kind of economic development is best: heavy industry or tourism. The U.S. Bureau of Land Management tentatively sided with coal Friday, when it issued a draft environmental study that proposes leasing more than 3,500 acres of federal mineral deposits southwest of Bryce Canyon to enlarge a 635-acre mine already permitted on private land. The Coal Hollow Mine near Alton has operated for less than a year and has divided residents in the nearest population hub, Panguitch. Expansion of Utah's only strip coal mine, about 10 miles from the park, would only further tensions. "It's helped our economy, so I'd say I'm in favor of it," Panguitch Mayor Lori Talbot said. "I have to say that very carefully because there are people in town who are concerned about the trucks." Coal trucks rumble down Main Street  U.S. Highway 89  en route to Interstate 15 and a railhead at Cedar City. There would be 153 more per day during the mine's 24-hour operations if the expansion moves forward, according to the BLM. Many in town had asked the state to head off that traffic before it approved an air-quality permit for the first phase last year. "My family, like hundreds of southwest Utahns, depends on the tourism-related economy of Bryce Canyon National Park, and also the local hunting, fishing and many other outdoor opportunities of this spectacular region," Panguitch shop owner Bobbi Bryant said. "If the BLM gives away our public lands to Big Coal, we risk losing our quality of life." But the bigger mine, the BLM projects, would employ 160 people, with 100 miners and 60 truckers transporting the coal. The proposal to move onto public lands  2,280 acres of federal surface area and 1,296 acres of private land overlying federally owned mineral deposits  drew a swift rebuke from environmentalists. Southern Utah Wilderness Alliance attorney Steve Bloch said it makes no sense to approve a mine contributing relatively little to the nation's energy supply so near a national park. Citing the study's acknowledgment of dust and lighting issues, he said a larger strip coal mine would cloud Bryce Canyon's famously clear starry skies while threatening the trophy mule deer herd on the Paunsaugunt Plateau. It's not surprising the BLM would favor energy development, he said, though it's disappointing that a supposedly environment-friendly Democratic administration apparently is signing off. "I am dumbfounded that this draft environmental impact statement is coming out under the Obama administration," Bloch said. "The mine will produce negligible amounts of coal and yet will have impacts on Bryce Canyon National Park and local Utah communities." The National Parks Conservation Association also panned the proposal, with Southwest Regional Senior Director David Nimkin saying it has the potential for "discouraging park visitation and degrading a natural wonder." The Sierra Club also rejected the plan as "a few years' worth of dirty coal" at the expense of wildlife, clean air and clean water. 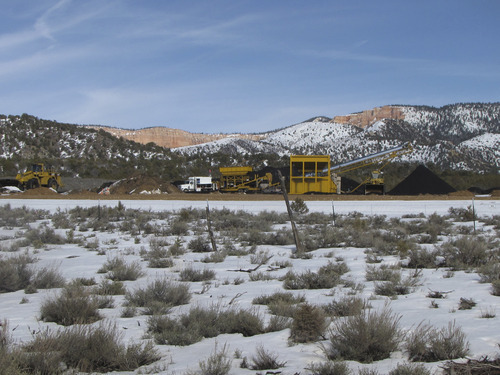 BLM officials said their evaluation, begun in 2006, led them to believe the effects to Bryce Canyonwould be negligible, and other resources could be restored after mining. The 24-hour operations would involve lights, they acknowledged, but they doubt anyone stargazing at the park would notice. "The light pollution or glow you get from St. George, Cedar City and surrounding communities would far outweigh any impacts," said Keith Rigtrup, district planner for the BLM's Cedar City-based Color Country District. Mule deer move seasonally across vast tracts and wouldn't likely be displaced by one mine, said Harry Barber, the agency's Kanab Field Office manager. "Individuals that think they're going to see a large impact," Barber said, "are going to be pleasantly surprised." Gov. Gary Herbert was traveling Friday, and a spokeswoman said he would not have a comment before reviewing the document. Mine opponents previously accused Herbert of pressuring state regulators to fast-track permitting of mining on private lands immediately after the company seeking the go-ahead gave $10,000 to his 2010 election campaign. Rep. Jim Matheson, D-Utah, also planned to review the analysis before commenting, spokeswoman Alyson Heyrend said. He has heard from local officials who want the expanded mine, she said, but also residents who don't. Alton Coal Development, the company operating the existing mine on private land and a likely bidder for the public tracts, did not respond to a request for comment. The proposal would allow open-pit mining where it requires removing less than 300 feet of overburden, and underground mining where the coal is deeper. The BLM estimates it would operate for 25 years, removing about 50 million tons of coal. The Bureau of Land Management will accept public comments on the draft mine-expansion proposal for 60 days after publication in the Federal Register, then likely make a final decision next fall.